This lemon tart is a variation of the easiest tart ever and despite not being equally easy – there’s a lemon curd to be made here – it’s just as delicious. Dough: whisk the flour and salt together. Using a stand mixer with the paddle attachment, beat the butter and sugar together on medium speed for about 3 minutes, until creamy and light in color. Beat in the vanilla. Reduce the speed to low, add the dry ingredients and stop mixing when the ingredients are fully incorporated but the dough is still crumbly – this happens quickly; don’t overmix, otherwise you’ll end up with a ball of dough. Set aside 1 cup of the dough and refrigerate. Sprinkle the remaining dough onto the prepared pan, distributing it evenly. Bring the dough slightly up the sides of the pan (to hold the lemon curd), then press it onto the pan to hold it in place. Prick the dough all over with a fork, then bake for 25 minutes or until golden. While the crust bakes, make the lemon curd: combine the sugar, half the lemon zest and yolks in a heatproof bowl and whisk together immediately; if you delay, the mixture will coagulate. Put the bowl over a saucepan of barely simmering water whisk continuously until the sugar dissolves. Add the lemon juice and, still whisking continuously, cook for about 5 minutes. Add the butter and salt, then use a spatula to stir constantly until the mixture has thickened, 6-7 minutes (is should be the consistency of sour cream). Strain the curd through a fine-mesh sieve into a bowl and stir in the remaining zest. Spoon the curd into the crust and smooth the top with a spatula. Sprinkle the remaining 1 cup of dough over the curd. Bake for 40-45 minutes, rotating the pan halfway through the baking time. The topping should be slightly brown, and the curd will begin to caramelize on top. 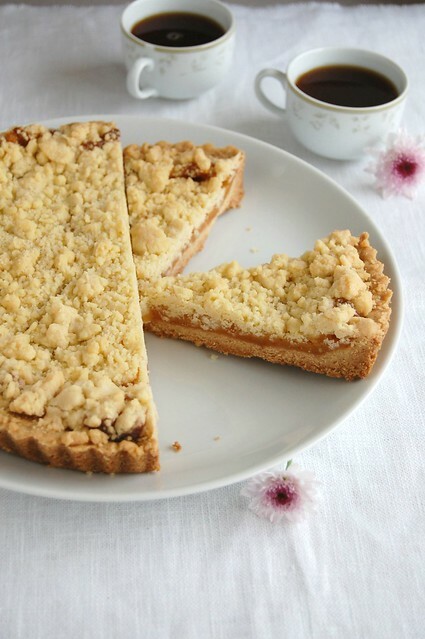 * I made the exact recipe above using a shallow 24cm tart pan with a removable bottom; I used 1 ½ cups of dough for the topping. wowwwwwwwwwwwwww, what a delicious tart. absolutely delicous. I love it. thanks for sharing your recipe. Hugs and blessings to you all the way from Costa Rica. I love you food picture by the way. Hello from Michigan! I adore your recipes and I too, have had issues with pinning your recipe pictures to my Pinterest boards. I pretty much use Pinterest only as an online recipe file, so was very disappointed when the pictures would not show. I decided to "pin" anyway so I can keep my favorites on file from your blog. It just shows the "blocked" picture and I post a note below it for any followers saying "Website does not allow picture to be pinned, but trust me, you'll love the recipe!" I too had that same problem with pinning your recipes on my boards. I don't know how you can fix it. I love your recipes and it's good to know that it not you. Patricia this tart looks beautiful. I am going to keep this in my recipe box. Thank you. Ummmm....I like lemon curd so much, and this tart looks perfect for me, to be enjoyed at a tea time with my friends. It looks like you can only now pin an image if the blogger has created a Pin It button for a particular post. At least that's how it's working for me. I guess that's kind of like giving permission to have your work appear on Pinterest, which has been a major issue lately for many photographers and such. Ooh, I love the crumbles here, delicious! I want to pin EVERYTHING you do!!! Well you can pin it but you need to pin it via Foodgawker..we love all things lemon in this house and can't wait to make it! I've noticed that about pinning your pictures on Pinterest, as I have tried many many times. I just tested and it's working now!!! =) Your photos will certainly dominate one of my boards... so many delicious things to try in your blog. i made your recipe on wednesday and it was really delicious..my children like it too!